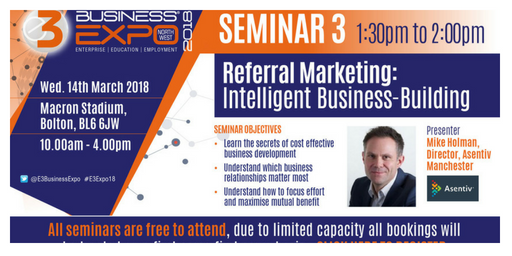 n Wednesday 14th March, the E3 Business Expo 2018 will feature a free seminar explaining the value of developing effective referral marketing strategies. It will show how firms can boost sales and market profile by building mutually beneficial relationships that yield a steady stream of recommendations. Mike’s will be one of a series of seminars held throughout the course of the E3 Business Expo, which will be held at the Macron Stadium in Bolton between 10am and 4pm. Hosted and organised by 1 Events Media, the event will also feature speed networking opportunities and an exhibition area with over 70 stands. Entry is free. “Business development is a key challenge for almost every company, but while there are countless sales and marketing channels for managers to consider, people often lose sight of the importance of existing contacts. Really investing in mutually beneficial relationships is a very cost-effective approach. For many companies, more than half of all new business comes from referrals. In addition to delivering the seminar, Mike Holman will be presenting certificates of achievement to delegates who recently completed the Asentiv course. These will include several exhibitors at the Expo. Details of the seminar programme, the exhibitors and visitor registration can all be found here.